Forests play a vital role in mitigating climate change and are crucial in the struggle for sustainable development. Not only do they have a fundamental role in the preservation of global ecological systems, they are especially important for supporting the lives and livelihoods of an estimated 1.6 billion forest dependent peoples. The ability of forest ecosystems to fulfill these critical functions is increasingly threatened by the conversion of forests to agricultural land and illegal and unsustainable logging. To address these drivers of deforestation and safeguard forest ecosystems, people and the climate, forest governance must be strengthened both in forest-rich developing countries and at the international level. Land use change, principally deforestation, is responsible for 12% to 20% of all global greenhouse gas (GHG) emissions. Reducing Emissions from Deforestation and Degradation (REDD+) is the UN mechanism to provide incentives for developing countries to keep their forests growing and reduce emissions. 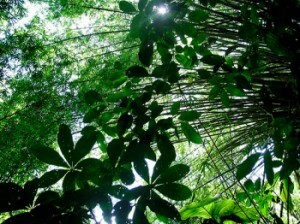 Under REDD+, payments for forest protection are made by developed countries to developing countries. This payment is tied to performance in deforestation reduction. But an international mechanism for REDD+ is yet to be put in place. Comprehensive financial arrangements for full-scale implementation have not yet been met either. Still, the number of REDD+ pilot-initiatives is rapidly rising. At COP18 in Doha important decisions on financing REDD+ and associated MRV (Measurement, Reporting and Verification) requirements have been postponed. A final decision on REDD+ was stalled by a lack of consensus on the relationship between finance and emissions verification. Instead, a “work programme” was set-up to discuss how REDD+ could be financed so that a final decision could be taken at COP19 in Warsaw, at the end of this year. Submissions on options for financing REDD+ are invited until 25 March 2013 and a first workshop on the topic will be held in Bonn in June 2013. A large number of developing countries continue to stress that forest-related activities under the UN Framework Convention on Climate Change (UNFCCC) need to be primarily publicly funded. A majority of developing countries expressed doubts over the appropriateness of market-based approaches and offsetting in particular. Brazil, for example, has repeatedly indicated at UNFCCC negotiations that “appropriate market approaches” for REDD+ should not include international offsets. Still, the idea of harnessing carbon market based mechanisms to support REDD+ has attracted substantial interest and most countries are in favor of them. Although the structure and future of such a potential market remains uncertain, a large share of REDD+ finance has already been spent on “readiness” activities to prepare countries for funding based on demonstrated reductions of deforestation and associated emissions. So, forest carbon markets are again expected to be a hot topic in the upcoming negotiations under the UNFCCC’s Subsidiary Body for Scientific and Technical Advice (SBSTA) in 2013. While REDD+ is currently not eligible under the Clean Development Mechanism (CDM), afforestation and reforestation (A/R) projects can be registered as CDM projects. Experience so far shows that potential atmospheric benefits of forest carbon projects can easily be outweighed by their negative impacts. Potential REDD offset credits may not represent real emission reductions due to leakage (deforestation is simply displaced from the project site to another site), the inherent impermanence of forest carbon, inflated baselines, problematic additionality testing and weak rules for MRV. If these credits are then traded in a global compliance market, global emissions would actually rise. However, offsetting is a zero sum game. Even if the credits were additional, allowing REDD projects in an offset mechanism would only shift emission reduction obligations from one country to the other and would not deliver the large long-term emission cuts required to stay below 2 degrees warming. Alternative financing options, such as a fund-based approach, carbon taxes, levies on international aviation or maritime fuels and financial transaction taxes exist and are viable. In the meanwhile California’s carbon market, the second largest cap-and-trade scheme after the EU, is set to include REDD+ credits from Acre Brazil and Chiapas Mexico. These credits should be used by companies that cannot meet reduction targets. A poorly designed mechanism could fail to reduce carbon emissions, while undermining the rights of forest-dependent people and community-based forest governance. However, despite unresolved issues and wide spread civil society opposition market regulators are close to a deal. The REDD Offsets Working Group (ROW) has released its draft recommendations (here) and opened a period of public comments until April 30. If the Air Resources Board accepts the ROW recommendations, REDD offsets may comprise between ¼ and ½ of the state’s offset quota.